Imagine one of those old family quilts, like the one your grandma made. It is probably not the loveliest thing to look at. It has different patterns and designs, some of the patches are torn at the seams or moth-eaten. However, it has sentimental value and most of all, character. When I think of Sao Paulo that is what I see – a patchwork conglomeration of people, neighbourhoods and lifestyles, that coexist in endearing chaos. At the heart of this messy metropolis is Avenida Paulista. Take a stroll along Brazil’s (and arguably, Latin America’s) financial Mecca on any given weekday and you will notice it is full of yuppies and executives rushing here and there, working for prestigious corporations and multinationals. Paulista professionals and young people work or study or both, but they always have time to party, without complaining about the fact that most Sao Paulo nightclubs close just as offices are opening. 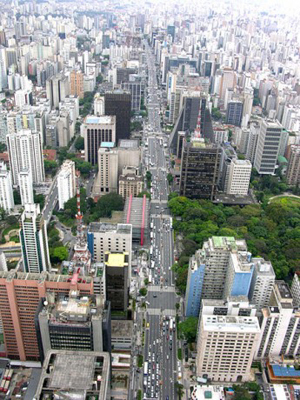 Other than heaving with promise and opportunity, Avenida Paulista serves another very important role in this sprawling concrete jungle: the avenue splits and unites `wealthy´ Sao Paulo, and ‘interesting’ Sao Paulo. 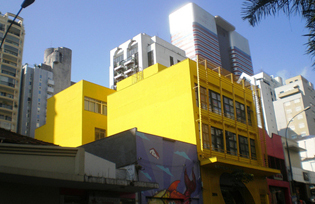 Jardims and Higienopolis are two of the most elite neighbourhoods in Sao Paulo. Here, most upper-class Paulistanos live in sumptuous homes, that generally come packaged with live-in housekeepers, luscious gardens, and top-notch security. In these neighbourhoods one can tap into the city’s award-winning gourmet restaurants or enjoy a cocktail on the terrace of the spectacular ‘Hotel Unique’ in lower Jardims – a mind-blowing U-shaped hotel. Jardims is also the home of “Rua Oscar Freire”, the Brazilian 5th Avenue, with exclusive boutiques offering luxury and designer brands. Here, money can buy you everything, even friends. If you have 50,000 reals to spare, you can buy a membership to the ´Club Paulista´; one of the oldest social clubs the city has to offer. However, money cannot buy perfection, even in Sao Paulo. My friend Lavinia has just moved there with her husband and son, and has described some scenes of her social life as something out of a nightmarish episode of “The Real Housewives” series. On the ‘other side of the Paulista’, is the ‘Lado Centro’. If you love art, theater and music, you will never get bored here. Many people are surprised when I express my enthusiasm for the ‘other side of the Paulista’. My Portuguese teacher and my friend’s landlord stare at me wide-eyed when I extoll the Lado Centro’s virtues. The stigma attached to the ‘Lado Centro’ comes from the fact that it has its fair share of beggars and vagrants. There are of course places in this part of the city you should absolutely avoid after dark, especially if you are a foreigner and/or a woman. However, it is in this unpretentious and genuinely underground environment that I have experienced one the most interesting art worlds I have ever come across. Brazil’s music scene has been emerging and evolving organically from centuries of musical traditions and an immense cultural melting pot. The ‘Lado Centro’ is home to the oldest Samba school in Sao Paulo, “Escola Vai Vai”, which annually comes first or second in the Sao Paulo Carnival Samba competitions. Every Sunday before Carnival, the entire Rua 13 de Maio is closed and used exclusively for Vai Vai Samba practice. It usually costs about 10 reals to go to the school to watch rehearsals if you are not a member of the Samba club, and once you get in, you will find that most Vai Vai members are happy to take you around the school, talk about the themes behind all the Samba costumes, and offer you an excellent Brazilian beer, a Caipirinha or both. Towards the end of the evening you will eventually have learned the basic samba steps, or at least think you have. Rua Augusta on this side of the Paulista is home to many recording studios, and a growing group of small theaters, and music venues that cater to every imaginable taste. Most of the people dominating the music scene at the moment are all very young, driven and talented. How does one go about meeting these artists? In my experience, Brazilians are extremely outgoing and love to befriend curious “greengoes”. Walking though the graffiti haven of ‘Villa Mariana’ with a friend, I stumbled upon a group of people decorating a strange instrument. One of them was Martin Briano, a musician from Argentina who had decided to give up his engineering degree to pursue his passion for music in Sao Paulo. The instrument they were painting is part of a project which involved using plastics in music. It’s been successfully featured in the MTV promos and ads that air here daily. When I asked Martin why he chose to leave Argentina to come to Sao Paulo, he answered quite simply: Now I work as a composer for MTV Brazil and have just come back from my first DJing tour in Europe. Reaching these goals at only 22 would have been almost impossible in Buenos Aires, because I actually have no official qualifications in music although I have been working at it all my life. The informality in the Brazilian working world and artists’ ability to network is not present in Buenos Aires but both are very much alive here. Most other Paulista artists I have met here enjoy success for the same reasons. ‘A Loca’ is another club on this side of the Paulista, which boasts regulars such as the “Love Actually” star Rodrigo Santoro. Here I met Icaro Silva, a Brazilian theater and TeleNovela actor. When he asked me why I wasn’t in Copacabana with all the other foreigners, I told him how much I was enjoying the art scene here – he couldn’t help but smile and nod in agreement: I’m working on a piece in Rio right now, but my whole career as an actor started here. That’s the way it is for a lot of artists. The theater world is just as fascinating, however unfortunately not as popular as the music world, as theater is not one of the mainstays of Brazilian culture. 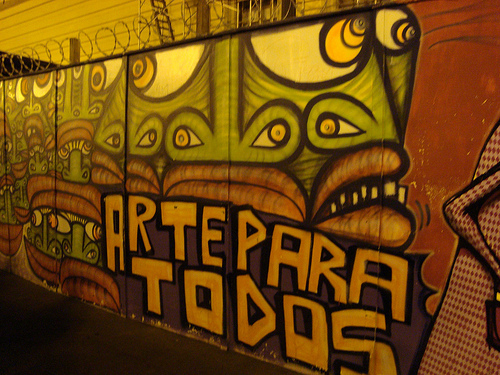 One of my first experiences in Lado Centro was at the theater seeing a piece by a neighbor of mine, Doctor Gilberto Gobbato. When I later interviewed him, he explained how theater is present in Sao Paulo because this city has something for everyone; but that theater is not popular amongst your average Brazilians. Theater was an art form imported by colonialists, and kept as a form of entertainment exclusively for the upper- classes’. The theater scene is kept alive through the efforts of keen students, critics and theater aficionados. It’s not that people don’t go. Between theater and television, actors have found work here. However, your average Brazilian would much rather spend 15 Reals at the stadium on a Sunday than go see a piece of theater. It’s ironic that the ‘Teatro Municipal’, the oldest theater in Sao Paolo, is located right in the heart of the city, and therefore not deemed as safe to attend as it once was by the upper-class crowd that used to frequent it. Whether upper-class Sao Paulo likes it or not, the construction of the new metro line – built for the upcoming World Cup and Olympics – will blur the dividing line between these very different neighbourhoods more and more. The ‘Linea 4 amarelha’ crosses the old center of the city, and has stops right on Paulista Avenue. There has been much debate about the opening of the Oscar Freire station for Jardims and Higienopolis. Paolo Manzo, an Italian journalist for La Stampa, suggests that it is because Jardims and Higienopolis don´t want to `lower their neighbourhoods’ tone’ by allowing easy access to their exclusive haven for the ‘plebs’ that live in the `Centro`. It will be interesting to see how the different parts of the patchwork quilt of Sao Paolo progressively come together, especially with the World Cup´s demand for much-needed refurbishment. Of course the social conflicts and disparities will not be resolved overnight with the construction of a metro line. One can only hope that the ´Lado Centro` becomes cleaner and safer, without losing its groovy beat to the homogeneity of development.